Happy Monday one and all. We had a good weekend. Tiny bit of snow that brightened up the ground. That made the fevvers come around more and we could see them so easy too. Mum did her usual stuff this weekend, including getting the rug sucking monster out. When she does that she picks up all of our toys first so that they don't get eaten. But if we want one, we have to go pick it out of the pile on the table. Ducky really wanted the nip nanner. 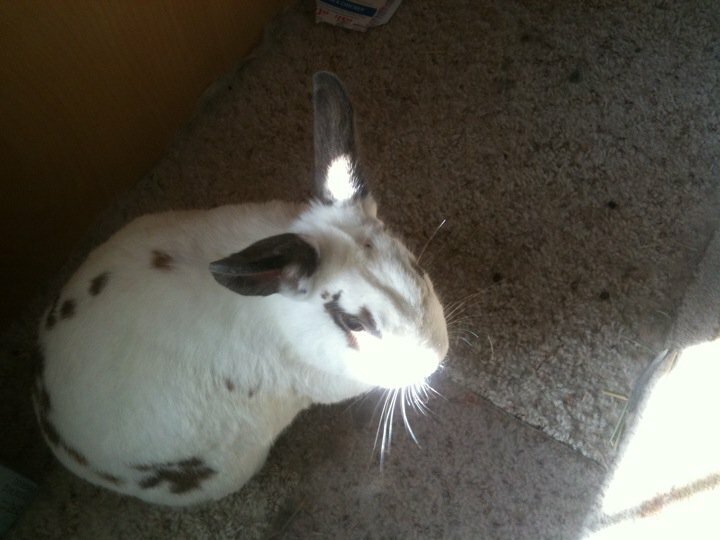 While we had snow, it came overnight, so we had lots of sun puddles to nap and play in during the day. Mum even sat at the kitch-hen table on Sunday afternoon to catch up on some paperwork and soak up the sunshine. We think mum is a bit solar powered like we kitties are. Otherwise it was a pretty quiet weekend. Mum didn't even watch much of the feetsball game last night with the bowling pros. Isn't all that excited about next weeks game either. Guess we watch for the commercials. Mum is way off on her days. She wrote the wrong date on her check at the food store on Caturday. First she put 1/21, then corrected it to 1/27. Plus our video from Caturday says 1/27 but in fact the day was 1/28. Mum, please refer to the calendar. At least she didn't go day hunting on a day she didn't have to. We told you on Caturday that we smelled ham and turkey in the food hunting stuff. Well it wasn't much, mum fixed some eggs on Caturday for lunch and put the the meat. Yes we got a little bit too, but now its gone. Mum has been trying to eat stuff out of the freezer to make sure the old stuff is gone before it goes bad. This is us, not doing too much. Napping, watching a few fevvers and sqwerls. Bright outside with a little bit of fresh snow. Mum went out and cleared the snow, then went food hunting. We smell HAM and TURKEY. Mum when she was done with the video got out the rug sucking monster and then worked on Derby's yak spot. Mum needs to do the laundry yet too. We want clean sheets to sleep on tonight with you. Yes kitties, we got chick-hen. Just not right away. Mum used some of it in last night with pasta and fredo sauce last night. We got some little bites too. Tonight we got some bits of turkey and ham from her sandwitch, plus a lick of her finger from the soup. So kitties, yes we do get more than the dry crunchies. Just in little bits here and there. Now it is nap and cuddle time. Mum has her book out to read. No speeches tonight for us, the picture box is OFF. HiYa, Ducky here, hope you all had a good weekend. We did ok, with getting naps, treats and extra noms. Plus mum filled up the big food bucket with a new bag of crunchies. Guess we have foods for a while. Mum stunk up the house this weekend and boy did it smell good. Derby had to snoopervise here while she cooked little pieces of chick-hen. Getting all nice and brown, with just a little oil of olives in the pan. When done she put them in a little container for later. Will use them when she does some pasta and fredo sauce this week for dinner. Has enough little chick-hen things for more than one meal too. Winning their games to be able to go play in the Stoupor Bowl are the guys named Pat and the Giant people. Looking Up; Looking Down with more info. So you guys don't remember how I get up here? Well mum posted it a year ago, the second time she caught me up there. The first was in the middle of the night. Go here to see that video and another one here. Since mum has not caught me in mid-jump, here is my path. Top of the puter printer and jump to the top of the cupboard. Then it is an easy leap to get to the top of the window thingy. Then back to the cupboard in the corner, then down to one of the tables. EasyPeasy! We had a decent weekend. We did get treats and lots of them over the weekend. Specially on Sunday. Ducky got shut in mum's closet, so we both got treats to make up for it. He was only in there a couple of hours. He went in when mum got dressed and hung up her robe. Then she went shopping and doing laundry. When he wasn't around for a few hours mum went looking for him, open treat jar in hand. The Pack - Yep, they losted. They deserved to lose, poor defense (which has been true most of this season). Not much offense, lots of dropped passes, fumbles, interceptions. Yep, time to go home and watch the better teams play! Maybe next year you can do better. So no Stouper Bowl party for us this year. We can just watch and enjoy the games for fun. Grampa Brett - his last game as a Packer, he also losted to the Giants in a playoff game. Plus we thinks is will be our last time reporting on Grampa Brett. Enjoy your retirement life Brett. We haven't been doing too much today. Napping, eating, bugging mum for treats (she hasn't given us any yet). So just a slow day here. With the snow this past week the ground is all covered and we had lots of fevvers to watch as they came to get their treats. Fevver TV, gotta love it. It is such a sad evening. Mum came home and gave us both a hug and told us Orlando bun hopped off to The Bridge today. I remember well when you taught me to do binkies, then we invented the binkie bop and danced the night away. 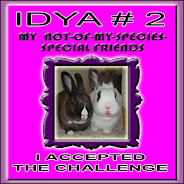 You and Fiona were my special NOMSSF (Not of My Species Special Furiend) and felt like an honorary bun with you guys. Lastly, you came up with the wonderful idea to cellybrate my purrthday every year with tock shots. So we have Tocktober now. Farewell my sweet little furiend. I hope we meet up again someday at The Bridge. Mr Hawk stopped by and sat in our crabby apple tree, first in one spot, then another. Mum was lucky she had her fancy flashy box ready. Biggify if you need to. Sitting in the other spot of the tree. Mr Red Belly Woodpecker sitting really still on the feeder, hoping Mr Hawk doesn't see him. Mr Squirrel plastered up against the trunk of the tree. Mr Hawk was just a few feet above him!. Me just resting on mum's stuff in the chair. She has a tendency to toss her jacket on the back of the chair, her scarf in the seat. Something soft to sit on and get all furred up. The Pack - as the number one NFC team, they got the weekend off. So there were games to decide who they will play next Sunday and that will be the Giant guys. Yeah, we beat them a few weeks ago. Plus they gotta come through the frozen tundra of Lambeau Field. Grampa Brett - still retired, but they showed him attending the Lions-Saints game on Caturday night. ......to the top of the big cold box. Then I can snoopervise mum cooking. I was watching her to the lobster the other day. Tomight she ate the last of it, says no more for a long time. I don't care if we don't have it, I don't care for it. Mum still has Al Fredo sauce left. Says she will do some chick-hen, pasta and sauce soon. Chick-hen, now were talking! Well maybe not all at once, but over their lifetimes, beans could easily have nine kitties. We had a good first day of the new year. A bit of playing, napping, extra treats. Mum even did the rest of the lobster, but this time she put it into pasta with Al Fredo's sauce. Yes she gave me a little bit again and Derby didn't want it. But tonight, mum didn't have any ice cream for him to lick the bowl. Yes, yesterday was lobster and butter. Only way to eat it mum says if you are just eating lobster straight up. Mum finished the crow-shay blankie she was working on. Just has to trim off the yarn ends, then she can give it to the lady at work for her baby to come. The Pack - Ended the regular season with a win with a record of 15 and 1. Our regular QB ARodg didn't play, but his backup guy did good. Team record of 6 TD passes and 480 yards, but mum says the defense has to show up better. Lots of scoring by the other team and it wasn't decided until The Pack intercepted to end the final drive by them Lions. Long game too, nearly 4 hours long, so mum had lots of time to crow-shay. The Colts - lost the game, gained the first pick in the draft in a few months. HiYa Ducky here. Yep it is another year. Not that it matters that much to us cats. We cellybrated early in the evening, we listed to Big Ben chime in the new year in London. Wish I could be there to cuddle in the new year with my sweetie Dora. Mum promised us special noms for our eve meal and she came through LOBSTER!!!!!! That is all she had for dinner, no veggies or salad, just lobster. Derby checking out the package and counting the lobster tails. Mum bought four so she could have some on another day too. About ready to go into the oven. Mum baked rather than broiled them, less likely to over cook them. All done and ready to eat, and I was ready to dig in too. Mum giving me some, so good, more please. 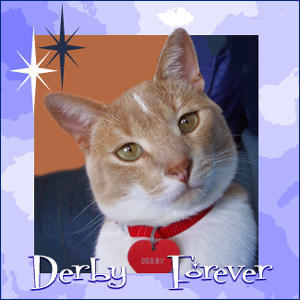 Derby, if you won't eat it, and he didn't, I will just take that piece. He didn't eat any of it, oh well, more for me. He did like licking the butter from mum's fingers! Dessert! Peppermint ice cream, Derby licking the bowl. Me, well, I wasn't into it. Guess my tummy was full of lobster. Hope everyone has a grate new year.